capital projects in the state, which is having negative impact on his administration. Governor Tambuwal made the assertion, on Wednesday, at the 2018 budget summit organised by office of the Special Adviser on Media and the Coalition of NGOs held in Sokoto. He lamented that the development has equally allowed critics to underrate him as a non-performing governor since the inception of his administration. “In 2017 budget, we proposed N204 billion but all what we got to execute the budget was N72 billion which come from Paris Club funds, loans and Internal Generated Revenue. “We are unable to execute physical projects but we are happy that we are able to invest heavily in ‘human projects’ through the prompt payment of workers’ salaries, pensions and gratuities. “I never collected N100 billion loan. I wonder how these misguided persons are ridiculing themselves in the social media in order to tarnish my image when they do not have facts. “What we have done is to seek for soft loans and we followed due process after approval from the state House of Assembly. In fact, some of these loans are deadlocked and we cannot access them while others are still under process. “So, how can we perform optimally? This is the setback we had last year and we were not able to complete some of these physical projects like roads and bridges for people to see and judge us,” he said. 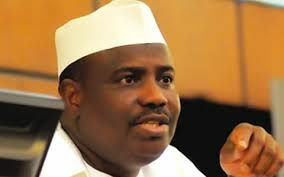 Tambuwal, however, promised that his administration will continue to imbibe the spirit of transparency and accountability in dealing with issue of governance in the state.